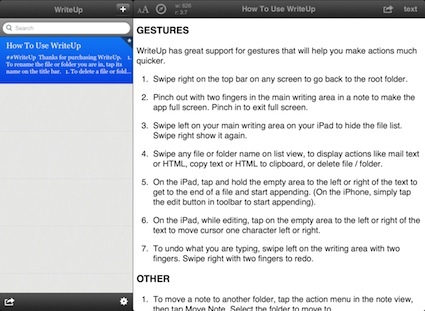 There are a lot of writing apps for the iPad. Many are over the top light on features, which they call ‘uncluttered creative area’ writing. Others have everything including the ability to input stamps of the kitchen sink. Since we do a LOT of creative writing and not taking on our iPads, it is important that we have a system that doesn’t block our ability to get the job done. Blocking in the form of not being able to get to our work area quickly or by limiting us to having a list of documents stuck on our iPads. One app we are trying across multiple people and their day jobs is WriteUp Notes. 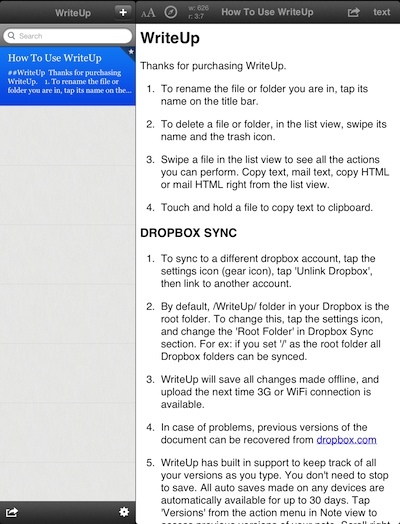 The app claim simple with Dropbox sync. So, we go in thinking we wont be able to do much but at least we can share. 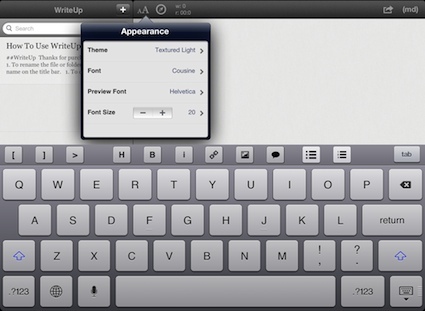 Actually, WriteUp is not as light on features as one would think on first glance. The work space is clear of buttons and pull downs along every edge. Information along the top is document level Theme, Font and Text size, as well number of words and location. There is a button to switch between MarkDown and Text and a Share menu. That is it! Time to get in and start typing! WriteUp Notes works nicely in Portrait and Landscape views, we have been surprised by a few other writing options that think we need only one. To move from full screen text to viewing the folders and documents, just swipe across the screen with a couple fingers. We mention ‘Folders’, yes you actually get folders to store you docs into. And those docs are not stuck in a single folder, they can be moved around later. As the name of the app implies, WriteUp Notes with Dropbox lets you share your documents with others via your free Dropbox cloud account. You can also attach your document contents to an email. At first, we thought that was just fine, then we discovered that the share button in the upper right corner actually hid many other ways of getting our typed work out to others. Through that button is your copy text/html, mail text/html, move the note, version and search, and view full screen. Wait… there is more! 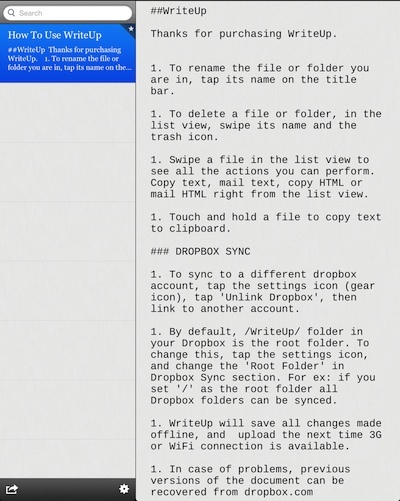 You can also move the document to your OmniFocus, tweet, message or add to your tumblr blog! Creating a new document or folder is done via the ‘+’ button mid way across the top bar. Interesting to find there is also the option add a ‘New Image’ which where you use a photos from your iPad photo library, take a new shot or use the last one you took with your iPad camera. Lastly, but a big one for us is the WriteUp Notes’ keyboard. We have often complained that the lack of features and excess buttons doesn’t mean we want to have to take three clicks to get to the special buttons needed to create MarkDown documents. WriteUp Notes heard us and added buttons that make sense to use for quick document creation without always having to remember MarkDown special characters. Win-win!